Quick, easy, budget friendly, and actually tastes like pizza! Making your own noodles from scratch and using the noodles immediately allows you to skip the steps of drying out the noodles or boiling the noodles before use. Use this recipe and go straight from rolling pin to baking pan! This is a recipe that can be thrown together with as little or as many ingredients as you want. I live in a household full of pizza lovers. I came up with this recipe idea when I was thinking about how I could feed my family at times when I was tired of making pizzas. This recipe gives my family the great pizza taste they love while encouraging little ones to try types of food besides those delicious triangle slices they are always requesting. Measure flour into a large bowl. Make well in center of flour and add eggs into the center well. Mix flour and eggs together gradually using a fork from the center well to the outside edge. When well combined, begin adding cold water one tablespoon at a time until the crumbly mixture begins to look slightly damp. Knead mixture together with your hands until you can form the mixture into a ball. Continue to knead dough on a lightly floured surface for about 5 minutes. Wrap dough in dampened dishcloth and let rest for 10 minutes. Roll out dough on lightly floured surface until dough reaches desired thinness. Cut dough into strips. Any dough not being worked with should be covered with a dampened dishcloth to prevent the dough from drying out. Recipe should make at least 12 wide strips. Use strips immediately or cover and refrigerate for use the next day. The first layer on the bottom of the pan should be sauce to prevent sticking. Then, layer noodles, sauce, pizza toppings, and a little bit more sauce. Repeat beginning with noodles and ending with sauce. Make sure to use enough sauce to keep noodles covered in sauce during baking, otherwise exposed noodles may become hard. Bake at 350F (180C) degrees for 40-45 minutes. With 12 strips of noodles, I make my lasagna in a 2.75 quart Pyrex dish laying 3 strips of noodles across. 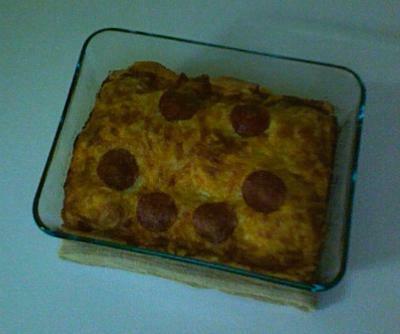 Makes a 4-layer pizza lasagna that will make the kids happy and feed a family of four generously! Looks GREAT! What time is supper, I'll be over! My family loves pizza too. This looks like a fun recipe to make with the kids. I will have to give it a try. Thanks. Return to Pasta Recipe Contest.